Many of us have been on a quest for the so-called balanced life, but when it comes right down to it…are we stressing ourselves out from the search? The ‘balanced life’ has often been described as maintaining a sense of wholeness and harmony in each area of life, simultaneously. This rendering of the idea of balance seems to set us up for the unattainable. Our lives are comprised of many interwoven parts. If we’re trying to maintain prefect accord in each area of our life at the same time we’re conned into thinking that means we have flawless relationships with our clients, co-workers, friends, significant others, and children, etc. We have an idyllic job, free of conflict and disheartening challenges; are able to churn out incredible design work on a daily basis, and have a great social life, which feeds our soul. We volunteer for worthy causes and always return our library books on time. We run six miles before dawn each morning, and healthy foods are consumed at every meal. Our living spaces are pristine and clean; even our dirty laundry is somehow magically organized. This frantic push for a “balanced life” leaves us feeling dejected…because it’s nearly impossible to measure up to such a lofty standard. I’ve found that the more uptight we are about our schedule and search for the balanced life, the more uptight we’ll be with interruptions of that schedule and balance. Assuredly, interruptions come! Life is full of unexpected moments. We can’t be all things to all people, and do all things all the time or we’ll end up living a frazzled existence. It’s time to make a shift. It’s time to realize that there are different seasons to life, when portions of our lives increase in their priority. It’s time to embrace flexible balance. If you’re a young creative, pouring your energy into the start up of your new business, there will be times when you need to decline other opportunities in your life in order to focus on building your client base. If you’re an established designer who’s the proud parent of an infant, you might need to decrease the number of new clients you take on until the baby sleeps through the night. Some days we need to be okay with dirty dishes in the sink, if it means finishing up a website project by the deadline. If you’re saving money for a computer, you’ll make-do with those old running shoes until that the new computer is sitting on your desk. We need to be okay with the exchange of priorities on different days and in various seasons of our lives. If we’re living within the context of flexible balance we’ll be more apt to appreciate disruptions, conflict, and challenges as an opportunity for the increase of patience and growth in our ability to adapt. We’ll be able to discern our most important focal point for our days, moment by moment, and for our lives, day by day. 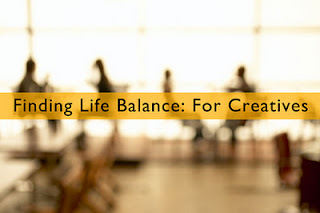 It’s crucial to find flexible balance that is compatible with your creative process and the normal ebb and flow of daily life. How do you feel about this post? Do you agree. Do you disagree? Is a well balanced life one you strive for or do you feel that restricts you? Let us know in the comments section and please share, tweet and plus with the social media icons below the comments section.